Comments: The Millennium Falcon is caught in a tractor beam and brought onto the Death Star. Luke Skywalker, Han Solo, Obi-Wan Kenobi, Chewbacca and the two droids hide from the Imperial scanning crew, who are sent onto the Falcon to find and capture its crew. After escaping capture, the heroes continue their mission to rescue the imprisoned Princess Leia. The Imperial Trooper was the winner of a Fan's Choice Figure Poll, which allowed fans to vote on 6 different figurs they'd like to see in the Original Trilogy Collection. 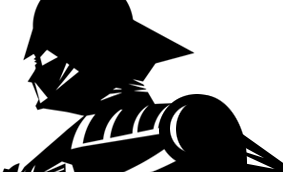 Voting ran from Monday, February 23rd, 2004 until Friday, March 5th, 2004. The figure won 28.21% of all votes. 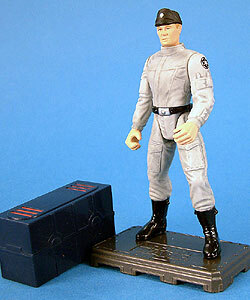 The figure was originally available in 1998 as "Imperial Scanning Crew Trooper" as a bonus pack-in with the Millennium Falcon Carry Case. It has lost the blaster and been repainted for this release.